A Caltech team is on the hunt for hidden planets. Building on research first published in 2016, they amassed enough unsexy but compelling evidence to book time at the Subaru Telescope on Hawaii’s Mauna Kea and initiate a search for the unseen planet. Picture this: NASA’s best and brightest poring over data from the historic Juno mission to Jupiter and posting awesome photos of the gas giant’s astonishing cloud formations and storms for us to wrap our heads around. Millions around the world have been thrilled by Juno’s steady flow of jaw-dropping images and discoveries. Now picture this: Concurrently and with much less fanfare, a team of intrepid scientists from Caltech, in Pasadena, California, is on the hunt for a mysterious object in the Kuiper Belt they call “Planet 9,” which their data indicates might be bigger than Neptune. Unfortunately for them, a high-definition image of their coy quarry probably isn’t going to appear any time soon – but they are a lot closer to finding it than you might think. The Caltech team is headed by planetary astrophysicist Konstantin Batygin and astronomer Mike Brown. Building on research that the team first published in 2016, they have now amassed enough unsexy but compelling evidence to have booked time at the Subaru Telescope on Hawaii’s Mauna Kea to initiate a systematic search for the as-yet- unseen planet. And what is the evidence that has persuaded peers to accept Planet 9 as a working theory? It’s all contained in several papers that have been published by the team over the past couple of years. 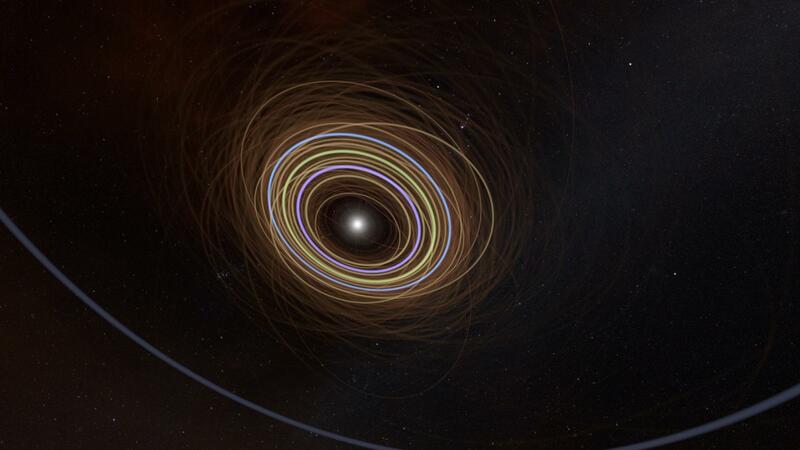 In those papers, the Caltech scientists lay out five theories to support their hypothesis that a very large ninth planet orbits the Sun and influences the motion of other bodies in the Solar System. Six known Kuiper Belt objects (KBOs) have unorthodox, elliptical orbits that are in sync with each other but not in sync with the general orbital tilt of most KBOs. The Kuiper Belt is a broad disc of icy rocks and other deep space objects beyond Neptune that all orbit the Sun in roughly the same direction and at the same angle. Dwarf planet (and demoted planet 9!) Pluto resides within the Kuiper Belt and is one of the KBOs that has an orthodox orbit at the same tilt as the eight recognized planets. There are innumerable small KBOs that are thought to be remnants of the planet-creating epoch of the Solar System, when small orbiting rocks fused together over thousands of millennia to create the planets. Although the Kuiper Belt is much, much wider than the asteroid belt between Mars and Jupiter, and is much further from the Sun, scientists have theorized that Jupiter’s enormous gravitational field might have had a significant role in the creation of both belts. Jupiter may have forced Planet 9 out of its inner orbit to its current proposed spot at the distant outskirts of the Solar System. Astronomers believe that Jupiter may have been the first planet to have formed. Over hundreds of millions of years, it repelled objects in both directions – toward the Sun, forming the asteroid belt, and away from the Sun, pushing asteroids and other objects into the Kuiper Belt (and, even further out, into the Oort Cloud). Batygin and Brown theorize that the KBOs with elliptical orbits different from most objects in the Belt have been pulled away from the pack by a massive object’s gravitational pull, and they have dubbed that object Planet 9. The known elliptically orbiting KBOs are also tilted – all at the same angle – about 30 degrees in a downward direction relative to the main plane at which the vast majority of other KBOs are angled. This “drooping” angle supports the hypothesized very large, dense object somewhere beyond the Kuiper Belt that exerts a strong downward gravitational pull on these particular KBOs. The only logical explanation proposed so far is a ninth planet orbiting the Sun at an angle distinct from the other known planets. And that, for lack of a more permanent name, is Planet 9. 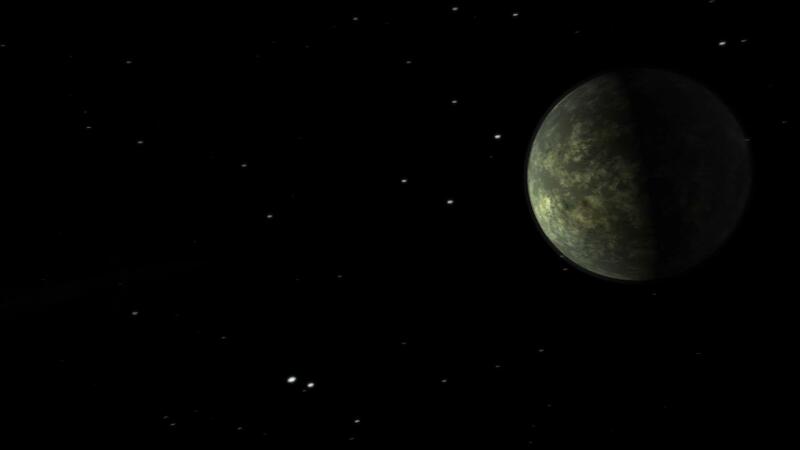 Batygin and Brown ran scores of computer simulations that included the hypothetical Planet 9 to theorize that there must be other KBOs (in addition to the six already identified objects) that tilt at even more extreme angles up to 90 degrees. Sure enough, there are at least five identified objects in the Belt that orbit at a 90-degree tilt. The data indicates that Planet 9 would have what’s called an “anti-aligned orbit”; that is, its orbit would be nearly perpendicular to the other planets, which would neatly explain the odd orbits of the KBOs they studied. One of Batygin’s graduate students at Caltech, Elizabeth Bailey, published a paper in 2017 whose thesis is that the suspected Planet 9 may have affected the orbits of all eight known planets of the Solar System. The paper points out that the standard angle at which those eight planets orbit is six degrees “down” from the Sun’s equator. However, one would have thought that the planets would orbit at zero degrees off the equatorial plane. So, what could account for this rather uniform tilt? Bailey points to a by-now familiar target: Planet 9. Only an object with the mass of the proposed ninth planet, moving in an elliptical and tilted orbit, could cause the slight tilt of the planets. Batygin strongly supports his student’s work. “Over long periods of time,” he states, “Planet 9 will make the entire Solar System plane ‘precess,’ or ‘wobble,’ just like a top on a table.” And it is this wobbling, due to gravitational pull, that could have caused the planets’ six-degree tilt. Finally, testing and observation have demonstrated that there are certain objects in the Kuiper Belt that actually orbit in the opposite direction from everything else in the Solar System. How can this be? Again, the culprit would have to be something with the gravitational pull of a massive, unknown object way beyond the known planets, an object that you’d have to call Planet 9. Where Did Planet 9 Originate? Many questions remain about where Planet 9 might be located and where it came from. The Caltech team believes that a focused examination of selected areas of the night sky will reveal its location and describe its orbital pattern. In addition, there are a couple of theories about where this oddball planetary object might have originated. One is that Planet 9 evolved during the same period as the other planets, but that it drifted perilously close to Jupiter. Such a close approach could have resulted in massive Jupiter ejecting Planet 9 far out beyond the extreme reaches of the Kuiper Belt, but not so far that it escaped the Sun’s gravitational anchor. Another theory is that Planet 9 once orbited another star – or was even an exoplanet without a home star system – drifting through space when it was captured by our Sun’s gravitational influence and pulled into an eccentric orbit. If 9 Is Company, Would 10 Be a Crowd? While Caltech’s team searches for Planet 9, other scientists are working through theories for yet another unseen planet – for now called (of course) Planet 10. Certain observed KBOs have unusual orbital angles, “twisted” by 30 or even 90 degrees. Others are “twisted” at a more moderate eight degrees. Remember how the Caltech cohort pointed to the unusual orbital angles of certain observed KBOs, twisted from the “normal” plane by 30 or even 90 degrees? Well, a team from the University of Arizona’s Lunar and Planetary Laboratory (LPL), led by astronomer Kat Volk, has identified a separate set of KBOs that tilt at a relatively slight eight degrees from the Sun’s equatorial plane. A minor tilt, yes, but very significant in the search for additional planets. One of the unusual facets of the Solar System – unlike nearly all other stars that have been found to have planets – is the absence of what’s been termed a “super Earth.” Most star systems have this type of planet, a world that ranges in size from somewhat larger than Earth to a crusty behemoth approximately the size of Neptune. Our Solar System is different, and Jupiter may be what makes it so. The Solar System has eight planets: the inner four relatively small, rocky planets, and the outer four comparatively huge gas and ice giants. If we were to find a “super Earth” lurking somewhere at the outer edges of the Solar System, we could learn more about the genesis of our planets, their placement, and even the question of whether there is life on exoplanets orbiting distant stars. According to current theory, Jupiter seems to be the main reason for the absence of a known “super Earth” in our planetary system. The gas giant’s enormous mass appears to have affected the order of the planets, as well as to have marked an invisible barrier between the smaller, rocky planets and the much larger outer planets. Jupiter may even have propelled our own “super Earth” – and yes, that would once again be Planet 9 – out beyond the Kuiper Belt. The End (of the Search) May Be Near! So, as we await the next set of jaw-dropping images from the Juno mission, let’s also remember to check the news for word about the Caltech team’s quest to find Planet 9 and LPL’s search for Planet 10. 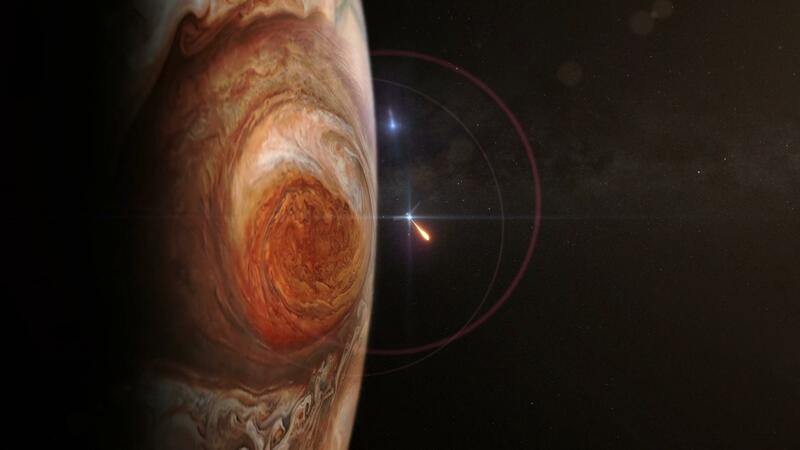 They might not be able to produce pictures as pretty as Juno does, but their findings about the two hypothetical planets, the origin and organization of the Solar System, and the prominence of Jupiter in the scheme of things could be equally breathtaking. The Juno probe has revealed Jupiter's majestic weather patterns in amazing detail. But are Jupiter's colors really that dynamic? It turns out, no. But just because these images utilize "false color" doesn't mean they're "fake news."